But if you’re a poor little self employed person like myself, you can’t afford to have x machines to make all these test possible. If you installed IE7 on XP, it installs on top of IE6, so normally you can’t test for IE6 any longer without the need of a virtual/another machine. But there’s a neat program that deals with this, so don’t worry! 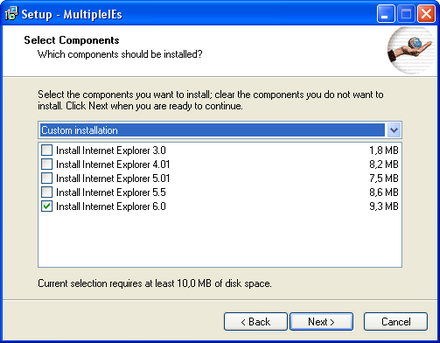 I normally use MultipleIEs for that: it’s a free, simple, elegant way of installing different versions of Internet Explorer on one machine and even run them simultanuously. When installing the tool, just tell it what versions you want (I only need version 6 besides my 7). One restriction: the trick doesn’t work in Vista, but their site points you to some solutions/workarounds for this. You do know that Safari is now available on Windows? Just download from Apple and install. I can’t say I like it, but it works. Opera is also an alternative today. I know. I like it as long as it runs on a Mac. On Windows, I don’t know… it’s like the interface is far from home there. I don’t understand why they didn’t adjust it a little to the Windows look-‘n-feel. I use this myself, but you do need to be careful because the lower versions of IE are only being emulated, they are about 95% right but I have still found some issues when testing a “real” version of IE6 that this tool doesn’t show up. For my own site, I do almost no cross-browser testing, though I do de facto cross-platform testing in that I use it from work on MSIE6 and Firefox 2, but at home it’s all Firefox on Mac OSX. For work, my testing is much crazier, in that my organization’s public site has to work with pretty much everything. Yes, I still test with Lynx. Yes, I still have old versions of Netscape and even Mosaic. About the only thing I don’t test on is the old AOL client and the old WebTV. I even test it on Windows Mobile and Blackberry… at home, I only adjust the site for Blackberry if it’s something I happen to need when using my OWN Berry. @Turtle: impressive, some profound testing going on overthere! I presume you have a lot of virtual machines? Or some dust covered 386’s, Mac Classics and Amiga’s? I find that MutipleIEs is a little hit and miss: for example, favourites seem to stop working in the IE versions lower than 7 (bizarrely, all the favourite links on my machine open… Printers & Fax. Weird). I can live with that… it’s not a functionality I need when I want to test. But it can be it has some other issues I don’t know of. I use VMWare Workstation. When I was setting up on my own it was the one of the ‘must have’ pieces of software it’s worth every penny. You can run your host with the latest browsers and then other OS’s and browser version as you like (or as your client likes). Heck for intranet’s the client could even build you a SOE VM client. This probably is the best solution (I also have VMWare Fusion), but you need different Windows licenses and it’s a lot of work to install all different versions. I’m a bit lazy so unless I really have to I stick to that one license for now. You’re right about the license requirements for Windows (at least as far as I know), but you can reduce the effort required noticeably using snapshots and/or linked clones. And if you don’t need all the comfort of VMware Workstation, but are willing to do some more work, even VMware Player or VMware Server might be sufficient (if you install VMware Tools into your images). Still not as simple and easy, but 100% reliable. It probably depends on the project on hands, if it’s worth the extra effort. MSDN Operating Systems subscription comes in at US$ 699 ($499 for renewals) and includes desktop and server OS’s too – all for development and testing which would cover the licensing. of course you could recycle older PC’s licensing for XP/2000 on laptops/pc’s that are not being used. Thanks for the very useful comments on this post, it’s becoming a nice overview of possibilities you have when you want to test on different browsers/platforms. Choose your weapon depending on needs and budget!